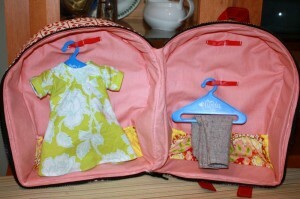 and the Dolly Outfitters Doll Carrier pattern. Our girls, Ava and Georgia, received Maplelea Dolls (the Canadian equivalent of American Girl Dolls) for Christmas and my husband and I had a great time making the doll beds, doll bedding, and some of the doll clothes for Christmas. While I liked the idea of a doll carrier, we were also looking for a dolly wardrobe, but didn’t want to add another piece of doll furniture to our toy room. The Dolly Outfitters Pattern was a great place to start, and by widening the bag, reinforcing the sides with hemp webbing, changing the zipper length and adding a few accessories to the inside, our Portable Dolly Wardrobe was born. lining fabric 0.75 m (0.8 yd) of mid to lightweight fabric, I used cloud 9 fabric’s flannelette. 2 1 inch, adjustable backpack strap adjusters. 2 bag body pieces are cut from both the main and lining fabrics. 2 are also cut from the batting. 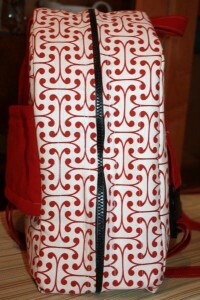 zipper casings are cut 4″ x 34″. 2 are required from each of the main and lining fabrics. 2 are cut from the batting fabric as well, but are 3.5″ x 34″. no zipper casing ends or bottom pieces are cut. 2 side panels are cut, 1 each from the main and lining fabric, 7″ x 12″. 1 is cut from the batting. 1 doll pocket is cut from the main fabric, 1 from the strap fabric. 2 are cut from the batting. 2 4″ strips are cut the width of the lining fabric to form the hemp webbing casings. ribbon is cut into 4, 7″ strips. 2 interior pockets are cut from the scrap fabric, 4.5″ x 14″ . elastic is cut into 2 10″ pieces. hemp webbing is cut into 2, 11″ and 2, 33″ pieces. doll pocket is constructed by layering the main fabric, the strap fabric and 2 layers of batting, right sides together with the batting on each wrong side, sewing 3/8″ seams, turning them inside out, pressing and top stitching each long edge. using a 3/8 ” seam, machine baste the batting (around the circumference) to the side zipper casings and the main side piece. 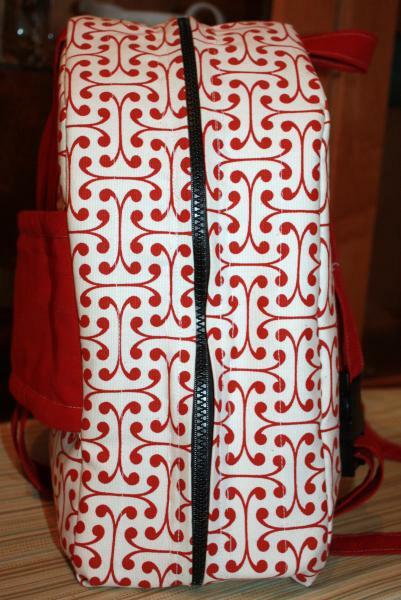 instead of attaching the zipper casings to the bottom and zipper casing sides, they are simply attached to the side pieces for both the lining and the main fabric. using a 3/8 ” seam, machine baste the batting to all 4 of the main bag pieces, along the outer circumference. the lining zipper opening is constructed by ironing 3/4 inch of one long side on each casing, then sewing them to each end of side pieces, leaving a gap in the centre to accommodate the zipper. the hemp casing is created by ironing 1 inch over on each long side, then sewing wrong sides together, using a 3/8″ seam around the entire circumference of the side piece and zipper lining. Beginning at the bottom corner that is attached the side piece, the webbing casing is then top stitched down, onto the lining sides all around the circumference, first over the 11″ hemp webbing along the bag bottom, then the 33″ hemp webbing around the sides and top. This is repeated for each side. the interior pockets are made by ironing over 1/2″ elastic casing on the top of each pocket piece and sewing them down by stitching across the hem 1/8″ from the edge. The pocket pleat is created at each side of the pocket, by ironing a 1/2″ pleat, 3/4″ in from each side edge. After the elastic is threaded through the top casing, the pocket is then basted into the bottom of each main bag piece of the lining fabric using a 3/8″ seam around the pocket edges. 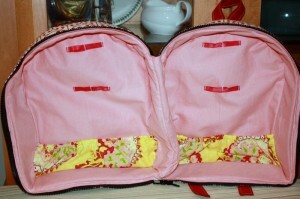 The centre of each pocket is secured to the lining fabric across the elastic casing to keep the pocket more organized. 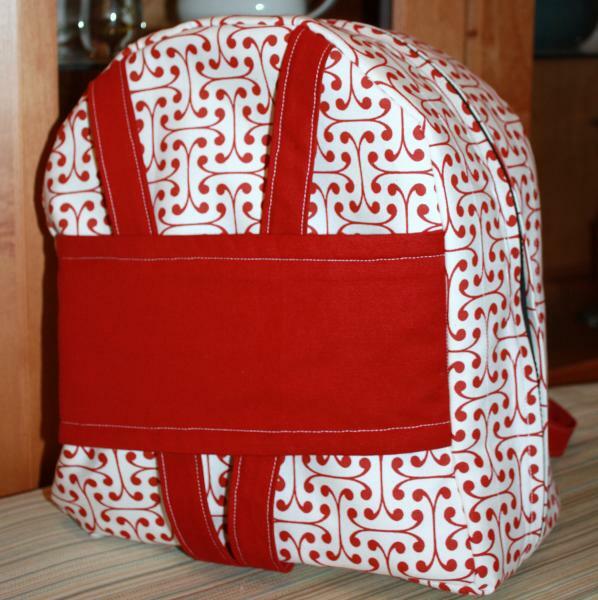 the interior ribbon hangers are created by sewing each of the 4 ribbon ends together with 1/2 ” seams, then appliqueing them, centred, and 2 inches and 6.5 inches from the top of each main bag lining piece. They are sewn at each edge and along their centre sections to the lining. the side pieces are attached to the main pieces by sewing the side piece to one of the long side edge, then sewing the zipper casings along the top, other side and bottom edge. once the outer bag and inner shells have been completed, I fit them into each other and hand basted them together just below the stitch line of the zipper. 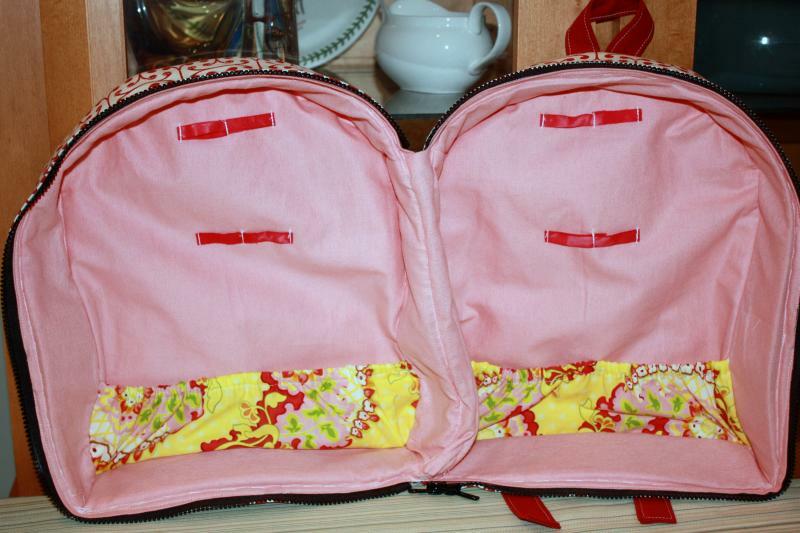 I then sewed them together along the zipper sewing line. This is a bit tricky, so go carefully and remember to pin the straps to the main bag so that they do not get caught in the seam line. To finish, I hand secured the edges of the pockets, the ribbon hangers and the centre of the pockets through all layers of fabric, using very small, hand stitches.